SolAero Technologies, a leading developer and manufacturer of high efficiency solar cells, solar panels and composite structural products for unmanned aerial vehicle (UAV) and aerospace applications, has partnered with Unmanned Systems Technology (“UST”) to demonstrate their expertise in this field. The ‘Silver’ profile highlights how their solar power solutions and precision aerospace structures can support a wide array of unmanned vehicle applications, including exploration, science and earth observation, defense intelligence and communication, and commercial telecommunications. SolAero’s UAV-TJ solar cell, with an average efficiency of 32%, delivers the highest volume production power density on the market. The lightweight solar cell technology can be produced in laminated sheets to specific voltages, and seamlessly integrated into the wings of UAVs. For composite UAV wings and structures, the photovoltaic (PV) sheets can be co-cured into the assembly. With superior efficiency at high-altitude temperatures, the UAV-TJ solar sheets can be customized to even the most extreme unmanned aircraft applications. SolAero’s world-class manufacturing facility is capable of producing more than 600kWe per year, and can manufacture panels from a variety of cell types and geometries. 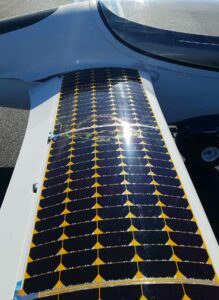 Custom solar wings have been developed for cutting edge unmanned aerial systems such as Bye Aerospace’s Strato-Air-Net, the Silent Falcon, AeroVironment’s Puma, and the U.S. Naval Research Lab’s Solar-Soaring UAV demonstrator.